Our internships are an exciting opportunity for aspiring college students and social activists! Operation BBQ Relief is a non-profit disaster relief organization that provides hot BBQ meals to those affected by disasters and the first responders helping those communities. In 2017, we were recognized by CNN Heroes as one of the top 10 finalist for Hero of the Year. We are looking for college students that have a passion to serve in the non-profit world, are creative, and want to use their skills to make a difference in the world. This is an exciting opportunity for aspiring communication majors and social activists! Operation BBQ Relief is a non-profit disaster relief organization that provides hot BBQ meals to those affected by disasters and the first responders helping those communities. In 2017, we were recognized by CNN Heroes as one of the top 10 finalist for Hero of the Year. We are looking to grow our social media team. College students that have a passion to serve in the non-profit world, are creative and want to use their skills in social media to make a difference are perfect candidates for this position. This summer internship will run (June-August), requiring approximately 10 hours per week with flexible hours. Mostly virtual, however, we may ask you to travel. For the right person, this could become a paid position. This is an exciting opportunity for aspiring communication majors and social activists! 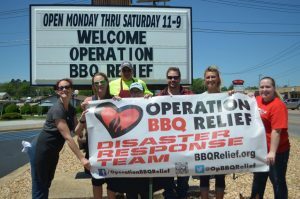 Operation BBQ Relief is a non-profit disaster relief organization that provides hot BBQ meals to those affected by disasters and the first responders helping those communities. In 2017 we were recognized by CNN Heroes as one of the top 10 finalist for Hero of the Year. We are looking to grow our graphic design team. College students that have a passion to serve in the non-profit world, are creative and want to use their skills in graphic design to help tell our story in a unique and creative way are perfect candidates for this position. This is an exciting opportunity for aspiring communication majors and social activists! Operation BBQ Relief is a non-profit disaster relief organization that provides hot BBQ meals to those affected by disasters and the first responders helping those communities. In 2017 we were recognized by CNN Heroes as one of the top 10 finalist for Hero of the Year. We are looking to grow our marketing team. College students that have a passion to serve in the non-profit world, are creative and want to use their skills in video journalism to help tell our story in a unique and creative way are perfect candidates for this position. As video production becomes increasingly critical to the growth, development, and success of managing a successful non-profit, we seek intern candidates that are leaders, who are passionate about non-profit management and possess skills in video production and editing. Successful non-profits are built on powerful ideas that inspire hope. We value those who want to use their creativity to clearly tell our story. These videos are essential to our marketing and fund-raising efforts. This is an exciting opportunity for aspiring communication/journalism majors and social activists! Operation BBQ Relief is a non-profit disaster relief organization that provides hot BBQ meals to those affected by disasters and the first responders helping those communities. In 2017 we were recognized by CNN Heroes as one of the top 10 finalist for Hero of the Year. We are looking to grow our marketing team. College students that have a passion to serve in the non-profit world, are creative and want to use their skills in photography to help tell our story in a unique and creative way are perfect candidates for this position. This is an exciting opportunity for an inspiring event planner and social activists! Operation BBQ Relief is a non-profit disaster relief organization that provides hot BBQ meals to those affected by disasters and the first responders helping those communities. In 2017 we were recognized by CNN Heroes as one of the top 10 finalist for Hero of the Year. We are looking to grow our marketing team. College students that have a passion to serve in the non-profit world, are creative and want to use their skills in event planning to ensure successful events are perfect candidates for this position. We are looking for an addition to our team to help plan all our events. The candidate will work with several departments to ensure that the needs for the event are met. The Event Planner must be organized and strive to ensure that every event promotes the organization in a positive light. In addition, the Event Planner will document these successes on our blogs and social media sights. This is an exciting opportunity for aspiring communication/journalism majors and social activists! Operation BBQ Relief is a non-profit disaster relief organization that provides hot BBQ meals to those affected by disasters and the first responders helping those communities. In 2017 we were recognized by CNN Heroes as one of the top 10 finalist for Hero of the Year. We are looking to grow our grant writing team. College students that have a passion to serve in the non-profit world, are creative and want to use their skills in writing to help tell our story in a unique and creative way that funders can understand are perfect candidates for this position. This is an exciting opportunity for aspiring communication majors and social activists! Operation BBQ Relief is a non-profit disaster relief organization that provides hot BBQ meals to those affected by disasters and the first responders helping those communities. In 2017 we were recognized by CNN Heroes as one of the top 10 finalist for Hero of the Year. We are looking to grow our marketing team. College students that have a passion to serve in the non-profit world, are creative and want to use their skills to help tell our story in a unique and creative way are perfect candidates for this position. This is an exciting opportunity for aspiring communication/journalism majors and social activists! Operation BBQ Relief is a non-profit disaster relief organization that provides hot BBQ meals to those affected by disasters and the first responders helping those communities. In 2017 we were recognized by CNN Heroes as one of the top 10 finalist for Hero of the Year. We are looking to grow our marketing team. College students that have a passion to serve in the non-profit world, are creative and want to use their skills to help tell our story in a unique and creative way are perfect candidates for this position.